Arizona Buyers Agents (AZBA) understands how important it is to find just the right area to relocate, whether it’s from across town or across continents. But how do you find the right area if you are not familiar with the Valley? AZBA provides access to area maps (see below) that will introduce you to the many spectacular communities in our incomparable Valley of the Sun. These include communities in the east Valley cities of Scottsdale, Phoenix, Paradise Valley, Cave Creek, and Fountain Hills. No matter what area in Arizona’s Valley of the Sun you wish to reside, you’re never far from the elements that make Arizona a premier destination – Hacienda-inspired indoor/outdoor living, vibrant business/tech development, enviable sightseeing, world class shopping, dining, entertainment, theatre, art, professional sports, spectacular hiking and biking with Sonoran desert views, and the best golf on the planet. We understand maps are just the start of all the information you’ll need. Our team’s in-depth knowledge of the area also is a valuable resource for you. 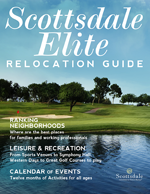 Plus, our free Relocation Guide and monthly e-Newsletter provide you with the finer details and current updates. Many of our agents are up in Scottsdale, know the Valley and Arizona intimately well, and absolutely love all aspects of the desert lifestyle. From fun and relaxation to business and community involvement, plus nuances in the Arizona real estate market, the entire AZBA team is dedicated to ensuring you have the answers you need, sometimes even before you ask the questions. We’ll also ask you lots of questions to precisely understand your unique needs. Let our team’s experiences living here, working here, raising families here, and enjoying life here help you optimize your search. We’re not just helping Arizona luxury home buyers find the right home, we’re helping them feel right at home here.